Shipping costs: Depending on the size of the shipment, shipping costs range from 1.90 € to 8.90 €. Free delivery on all orders over 80 €! Itella SmartPOST up to 4.90 €, under 5kg. Read more about this delivery method here. It is also possible to choose the delivery method for the delivery methods, in which case the order is picked up and paid by mail. A cash deposit of 8.90 € will be added to the delivery. Because we want to make ordering online as easy as possible, we offer a variety of payment options so you can choose the best option for you. 1. Online banking payment through our website: Once you have collected your order and proceeded to checkout, you can pay for your purchase directly via bank transfer. Online payments are processed by Paytrail in cooperation with your bank. 2. Credit card payment through our website: Card payments will be processed as a debit and can be paid with a credit card (MasterCard, Visa, or Visa Electron). 3. Credits: You can also pay using store credits which you can accrue by trading in your cards (more info available at: poromagia.com/credit/), or by winning them at our tournaments (poromagia.com/events) or joining PoroClub: poromagia.com/poroclub. 4. Cash on delivery (ONLY domestic shipments within Finland): The shipment will be picked up and paid by Posti. A cash deposit of 8.90 € will be added to the order for this service. 5. In-store we accept most payment cards, cash, and Poromagia credits. For how long are unpaid web orders reserved? Normally, we hold pick-up orders for seven days from the date of the order. If you are unable to pick up your order within a week, please contact us at +358 50 355 2252. All domestic deliveries within Finland will take about 2-3 business days, though this is an estimate calculated from the time the order was made, and actual delivery time may be affected by conditions out of our control, such as bad weather. For international shipments within the EU please expect 7 to 10 business days for your delivery. Online orders have a standard 14-day return policy. The product must be in the same condition as it was at the time of purchase. Thus, open booster packs or board games cannot be returned. Returns for online orders are easily done by post. It is best to return products in the same packaging (envelope or package) that they were shipped in. You can return your order with the Mail Easily Code to any Post Machine or post office. You may order the return code at posti.fi/returnparcel by entering the shipping ID (code begins with JJFI). Please return the package as instructed. We will pay the shipping costs for such returns. Products purchased from our store have a 7-day return policy against receipt. Return policy does not apply to bulk cards or new products that have been removed from their original packaging. If you receive a defective product or any other complaints, please send an email detailing the issue to info@poromagia.com. Don’t forget to mention your name, username, and order number (found on the invoice that was included in the package). We will respond as quickly as we are able to via email. Should any dispute be impossible to settle by negotiations between parties, the customer may refer the matter to the Consumer Disputes Board (https://www.kuluttajariita.fi/en/index.html). Before bringing the matter to the Consumer Disputes Board, the consumer must contact Consumer Advisers' Advice (https://www.kkv.fi/en/consumer-advice/). For Magic: The Gathering products, we abide by the Wizards of the Coast policy to post the orders only upon the official release date. Other products will be delivered by the release date. Most other products will arrive at the store by the official release date, and can then be purchased off the shelf as usual. For board game and expansion releases, please understand that our release dates are at the mercy of the publishers and may differ from the earliest published release. We will ship the products as soon as they arrive at our warehouse. Orders containing pre-release products will be sent after we have received all of the order items in our warehouse. We pay special attention to packaging to guarantee our customers receive their products in the expected condition, without being damaged during shipment. When ordering individual cards and other items sent as letters, we stack the cards into bundles and enclose them between cardboard for protection from bending. In addition, the cards are cushioned with bubble plastic. We ship in C5 and C4 shell envelopes with windows. Parcel shipments are packed in a cardboard box or power card. If necessary, these will be carefully packed with bubble wrap as well. All parcels, registered letters and postal orders will be sent with a tracking code. We have a system that uses a text message to notify your cell phone when the order can be retrieved from the pick up point. In addition, you will receive a tracking code in your confirmation email so you may track your shipment. This service requires that you provide a functioning email and mobile phone number. 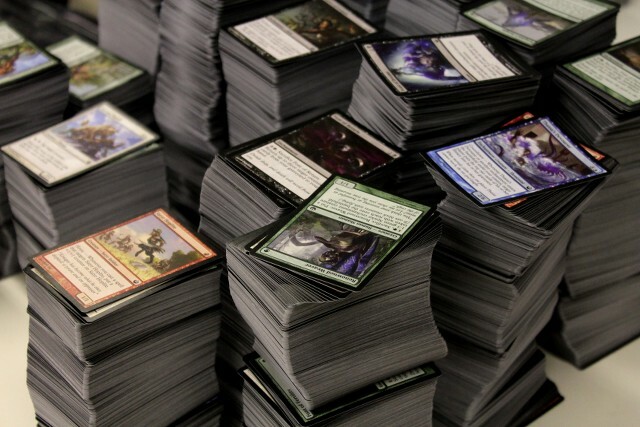 We reserve the right to send Magic: the Gathering single cards if they are clearly ordered for resale. Card prices may rise due to bannings or unbannings. In such cases, we reserve the right to send single cards that are clearly purchased for resale. However, for all orders we place cards (4pcs) but limit the excess.